HUNTSVILLE, Ala. -- Source selection for the newest Future Attack Reconnaissance Aircraft, or FARA, is underway as the Army's Future Vertical Lift Cross-Functional Team looks to award two vendors in March 2020. After the Army makes a selection, the two companies will present competitive prototypes followed by a "government-sponsored fly off" in 2023, said Brig. Gen. Walter Rugen, the FVL cross-functional team director. The Army will then transition the FARA into an official program of record. "FARA is going to be the greatest armed reconnaissance helicopter in the world," said Rugen, as he discussed FVL at the Association of the U.S. Army's Global Force Symposium Wednesday. The Army has long needed a new reconnaissance aircraft, Rugen added. 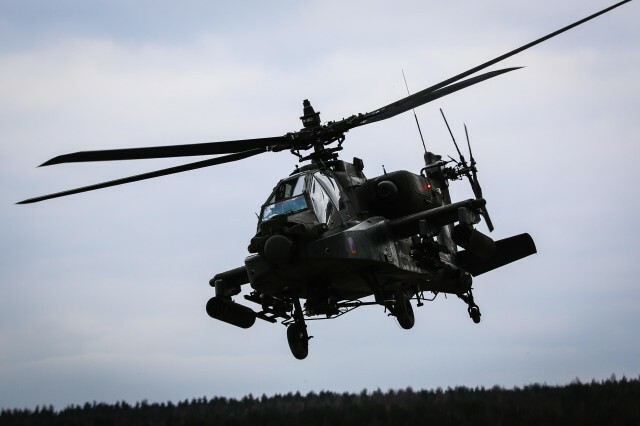 Back in 2012, the Army reassigned a portion of its AH-64 Apache fleet to support heavy attack reconnaissance squadrons, as a replacement for the OH-58 Kiowa. "This was a suboptimal solution," Rugen said. The Apache is an attack helicopter; it is not an armed reconnaissance helicopter. [At the time,] we did it for budget considerations." After FARA is fielded, the Army plans to replace about 50 percent of its aging AH-64 fleet, Rugen said. "We are having to meet our current obligations and … our aviation force is about 83 percent committed around the world on any given day," said Brig. Gen. David Francis, with Army G-3/5/7. "We have the challenge of meeting our current requirements and upgrading our current fleet, all while getting ready to jump to these leap-ahead technologies that future vertical lift will provide." In addition to the FARA program, the Army plans to replace the UH-60 Black Hawk. In that regard, the force has made some positive strides toward development of the Future Long-Range Assault Aircraft, or FLRAA, Rugen said. In 2016, the Army was tasked to lead the joint vertical-lift effort and conduct an analysis of alternatives, or AOA, for the FLRAA program. Now that the AOA is complete, the FVL CFT plans to release their findings next quarter. These findings, combined with the inputs from other services, will finalize the FLRAA requirements. Eventually, a Capability Development Document will be released, followed by a Rapid Fielding Initiative, Rugen said. "With FLRAA, we're certainly looking at every opportunity to fully leverage the success of the [Joint Multi-Role Technology Demonstrator, or JMR-TD,]" he said. The JMR-TD can both operate as an air vehicle demonstration platform and as a mission-systems architecture demo platform, officials said. The JMR-TD provides a way to validate up-and-coming vertical lift capabilities to fuel the FVL CFT's decision-making process. "Again, [FLRAA] is a multi-service program that is led by the Army," he said. So, it is a bit more complex for the Army to get … milestone decision authority. But, I think the Army is committed to seizing any opportunity that the JMR-TD has laid out for us."